This is my new favourite. My new favourite several things. My new favourite breakfast. My new favourtite snack. My new favourite chia seed pudding. Hell, it's the best chia seed pudding I've ever made, and it's the best chia seed pudding you'll ever make, and I'm not even nervous to make that promise cos I know I can deliver. Simply measure out all of the ingredients, apart from the chia seeds, into a blender and blend on the highest speed for 1-2 minutes, until smooth. Add a little more salt or sweetener (and maca and any spices you are using) to suit your taste and blend again to combine. Once smooth, pour the mixture into a bowl, jar or tuppaware and weigh out the chia seeds into the same bowl. Stir or whisk with a fork to fully combine the seeds, and leave to absorb for 5 minutes. Stir again to ensure the seeds are fully coated in order to absorb the liquid evenly, and then set in the fridge for 10-20 minutes. Stir again (at this point, if you want to, add some leftover cooked quinoa if you want to bulk the pudding out a little more) and then leave in the fridge until ready to serve. Leaving overnight will make the seeds the perfect softness and plumpness, but you can enjoy after as little as half an hour. Top with your choice of fruit, nut butter, tahini, extra spices and superfood powders, granola, qnola, nuts and seeds. Enjoy for breakfast, as a snack, stirred through smoothies, stirred through porridge or served alongside desserts. This recipe is something special. I'll admit now that if its yoghurt you came for, you won't be satisfied with this post. This kind of yoghurt is no usual kind of yoghurt. It is creamier. It is tastier. It is dairy free. It is quick to make. It is easy to make. It is not a massive palaver to make. And it is D-licious. Unlike conventional homemade yoghurts, this recipe doesn't require a yoghurt making machine, nor does it demand that you sit, wait and watch for hours, monitoring and altering temperatures as the yoghurt develops the perfect live cultures and probiotics. Although these probiotics and doses of good bacteria are incredibly good for you and your gut, many processed, shop-bought yoghurts contain additives, chemicals, sugars, flavourings and emulsifiers. That is one reason why I prefer to make nut yoghurts instead. The other reason is because they taste almost too good to be true..
For anyone who is trying to cut dairy out of their diet, but who is bored of coconut yoghurt or fed up of nut milks, a nut-based yoghurt like this is the perfect option. Nut yoghurts are creamier, thicker and more fulfilling than normal yoghurts. I don't eat dairy because I personally feel more tired when I do, and notice a considerable difference in the condition of my skin too. This kind of yoghurt is high in protein and healthy fats, which means it keeps you feeling full of energy for longer, and also contributes to healthy cellular activity, skin, hair and nails. This recipe is incredibly quick, easy and stress and mess free. It makes a perfect breakfast either on its own or with toppings (see below for suggestions) and also makes a brilliant dessert, similar to a mousse or a cold custardy pudding. It requires only a few ingredients, and it is one of my favourite things to make if I have fruit that's on it's last legs. The riper the mango, the better this recipe will turn out as it blends much more smoothly and is generally juicier. You can also try using banana, stewed apple, normal or blood oranges or other fleshy fruits like melon, in place of the mango. You can even increase the quantity of liquid you use too, if you want to make more of a smoothie or pouring yoghurt for cereal or fruit. Go bloody nuts with it. + Retrieve the coconut flesh from the coconut the evening before, and soak the cashews whilst you sleep, so that when you wake up bleary eyed, you can leave the hard work to the blender. + Make a large batch and store it in the fridge for up to 1 week. This makes the perfect instant grab & go breakfast, and also travels well if you want to take it in a container to work. Simply place the cashews into your blender along with your liquid of choice, and blend on a high speed for 2 minutes. With the blender still running, gradually add the coconut oil. Add a little more coconut water or nut milk if the mixture needs help running smoothly, then chop the mango and scrape the flesh from around the stone and add to the blender, along with the remaining ingredients. Blend for a further 2-3 minutes, adding more liquid if you think it requires it (this really depends on how thick or runny you'd prefer the finished product). Once smooth, pour into a bowl or some tuppaware/a jar to store in the fridge. + Serve with poppy seeds, chia seeds, Qnola (Beetroot or Ginger create amazing flavours and add the perfect texture) chopped nuts, fresh berries or fruit (more coconut flesh or mango works well). I don't even know how I have left it so long to post this recipe. It is by far one of my favourite breakfasts (also a perfect snack or dessert), and, providing instant yet long-lasting energy, is my go-to pre-workout meal. The combinations are endless, and the toppings are what really take things up a notch. The texture of chia seeds is unusual and completely unique. At first, people can be sceptical about even giving them a chance, as they look and feel unlike any other kind of food - and not in an appetising way. However, prepared the right way, chia seeds can become one of the most delicious sweet treats, and are packed with antioxidants, fibre, protein, healthy fats, vitamins and minerals. They swell when they are combined with a liquid, tripling in size, which means when you consume them they'll contribute to keeping you fuller for longer, without making you feel bloated or 'too full'. Additionally, they retain a lot of the liquid, keeping you sufficiently hydrated too. Below are just four simple recipes of my favourite flavour combinations. I serve these as warm porridges, but store the leftovers in the fridge and enjoy them for days as a cold chia seed pudding, for an instant, on-the-go breakfast and portable snack. This is also one of my favourite travel companions. The chia seeds soak up all of the liquid, so it doesn't leak from the container! The most important component of these recipes is the milk. The cashew milk is thick and creamy and I've perfected this as a base for these recipes to create the softest and creamiest results. I have previously used coconut water and nut milks, but as they are quite thin liquids, the result is generally less creamy and doesn't bind as well. You want the gel of the chia seeds to really combine and merge together, and if the milk isn't thick enough, you'll end up with more chia seeds than you do gel (see the image of all four bowls above - the pink one without any toppings is made with normal coconut water and is a lot wetter - the chia seeds more separated - than the others. This was an experiment, but the recipe for the Beetroot Pudding below, is with the thicker milk, which I believe tastes better). Start by preparing the milk. Blend the cashews with your the water and your chosen nut milk for 2-3 minutes, on the highest speed. Sieve the milk, either through a sieve or using a nut milk bag (cashews don't create much pulp though, so a sieve works fine). Pour the sieved milk into a medium saucepan and simmer on a medium heat. Add the chia seeds, vanilla, natural sweetener, salt, and cinnamon and stir constantly to ensure the seeds don't stick to the sides of the pan, or float on the top of the milk. Reduce the heat as the mixture begins to boil and thicken, and simmer for about 15-25 minutes. This will depend on the thickness of your milk and the exact quantity of chia seeds used. Stir regularly to make sure the mixture doesn't stick to the bottom of the pan. When all of the liquid has been absorbed and the mixture is thick and creamy - almost resembling rice pudding - remove from the heat and serve. + If the mixture seems too wet, add more chia seeds. If it seems to dry, add a little more water or nut milk, gradually. Simply heat the almond butter and water in a small saucepan, whisking constantly. Add your sweetener of choice, the salt, the coconut oil and the vanilla, and continue to whisk. Simmer on a low heat, whisk in the cacao powder, and when it has dissolved and fully combined, remove from the heat and serve. + This recipe is extremely quick. If you cook it for too long, it can quickly burn or begin to thicken too much. If it becomes too thick, try adding a little more water and sweetener. Start by preparing the milk. Blend the cashews with your the water and your chosen nut milk for 2-3 minutes, on the highest speed. Sieve the milk, either through a sieve or using a nut milk bag (cashews don't create much pulp though, so a sieve works fine). Pour the sieved milk back into the blender, add the beetroot powder or the grated beetroot and blend for another 2 minutes. Then pour into a medium saucepan and begin to simmer over a medium heat. Add the chia seeds, vanilla, natural sweetener and salt, and stir constantly to ensure the seeds don't stick to the sides of the pan, or float on the top of the milk. Reduce the heat as the mixture begins to boil and thicken, and simmer for about 15-25 minutes. This will depend on the thickness of your milk and the exact quantity of chia seeds used. Stir regularly to make sure the mixture doesn't stick to the bottom of the pan. When all of the liquid has been absorbed and the mixture is thick and creamy - almost resembling rice pudding - remove from the heat and serve. Start by preparing the milk. Blend the cashews with your the water and your chosen nut milk for 2-3 minutes, on the highest speed. Sieve the milk, either through a sieve or using a nut milk bag (cashews don't create much pulp though, so a sieve works fine). Pour the sieved milk back into the blender, add the berries and blend for a further 2 minutes, until the mixture is smooth, and purple in colour. The pout the infused milk into a medium saucepan and simmer on a medium heat. Add the chia seeds, vanilla, natural sweetener and salt, and stir constantly to ensure the seeds don't stick to the sides of the pan, or float on the top of the milk. Reduce the heat as the mixture begins to boil and thicken, and simmer for about 15-25 minutes. This will depend on the thickness of your milk and the exact quantity of chia seeds used. Stir regularly to make sure the mixture doesn't stick to the bottom of the pan. When all of the liquid has been absorbed and the mixture is thick and creamy - almost resembling rice pudding - remove from the heat and serve. Start by blending the berries with the water, on a high speed for 2 minutes. When smooth, transfer to a medium saucepan. Add the lemon juice, salt and sweetener of choice and whisk to combine everything. Bring to the boil and then simmer for 20 minutes, adding a little more lemon juice and a little more sweetener if the mixture is too watery. Once it has thickened, serve, or pour into an airtight jar and store in the fridge. Start by preparing the milk. Blend the cashews with your the water and your chosen nut milk for 2-3 minutes, on the highest speed. Sieve the milk, either through a sieve or using a nut milk bag (cashews don't create much pulp though, so a sieve works fine). Pour the sieved milk into a medium saucepan and simmer on a medium heat. Add the chia seeds, vanilla, natural sweetener, salt, and cacao powder and stir constantly to ensure the seeds don't stick to the sides of the pan, or float on the top of the milk. Reduce the heat as the mixture begins to boil and thicken, and simmer for about 15-25 minutes. This will depend on the thickness of your milk and the exact quantity of chia seeds used. Stir regularly to make sure the mixture doesn't stick to the bottom of the pan. When all of the liquid has been absorbed and the mixture is thick and creamy - almost resembling rice pudding - remove from the heat and serve. Simply heat the almond butter and water in a small saucepan, whisking constantly. Add your sweetener of choice, the salt, the coconut oil and the vanilla, and continue to whisk. Simmer on a low heat, whisk in the spices and superfood powders, if using, and when it has dissolved and fully combined, remove from the heat and serve. Simply place all ingredients in your blender and blend for 2-3 minutes on a high speed. Add a little water if the mixture needs help to get going. Season to taste and enjoy. Salmon is such a nourishing food. Growing up, i refused to eat fish, and it was only really when i first started to make educated, thoughtful changes to my diet that I began to eat it. Now, i am completely obsessed. Salmon is my favourite fish and luckily for me, is incredibly good for you. High in protein and even higher in essential omega 3 fats, salmon is an amazing source of essential vitamins, minerals and macronutrients. It really is an all rounder when it comes to food. As you’ll probably remember being told time and time again by your mother, it is ‘good brain food’, and that’s thanks to the omega 3 fatty acids. They also contribute to excellent cell renewal, which is what makes them improve your skin. Our bodies need these fats to protect our internal organs and to ensure our cells are doing exactly what they should be, and functioning optimally. Combined here with a combination of other nutritious ingredients, the beautiful flavour of the salmon is really brought out. Smoked salmon, of course, has a lot more flavour, but it is its texture that makes this pate work so well. What starts out as a slimy string of fish becomes a smooth almost butter-like spread, perfect for sandwiches or added to salads. Makes enough to serve 4-6 people - Lasts for weeks in the fridge. + Can add crushed garlic, pepper, dill, capers, diced shallot, nutritional yeast. Start by blending the salmon and coconut oil in a blender, on a high speed. 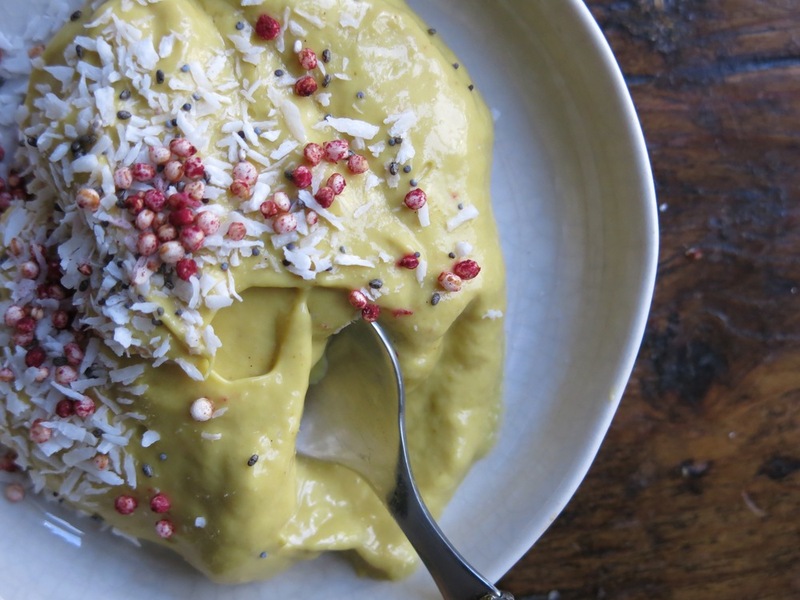 Blend for 1 minute, scrap down the sides, then add the tahini, lemon or yuzu and the avocado, scraping the flesh gradually so it is thinner and smoother. Blend for 2-3 minutes, scraping down the sides if you need to. Season to taste, add your extras and scrape into an airtight container or sterilised jar. Set in the fridge for about 20 minutes, or enjoy straight away. Spread onto crispy miracle bread with sliced avocado is my favourite. It is also wonderful spread inside chicory leaves. Top with herbs, nuts, seeds or even chopped fruit. Soft goji berries add a delicious flavour.